Middle Back Pain: Causes and treatment of Back Pain Between Shoulder Blades. Do you suffer with pain between your shoulder blades - especially while sitting for any length of time? Middle back pain is a pain arising anywhere between the shoulder blades and the waist. This is a common complaint where the ligaments, joints and muscles of your mid back are put under excess pressure. 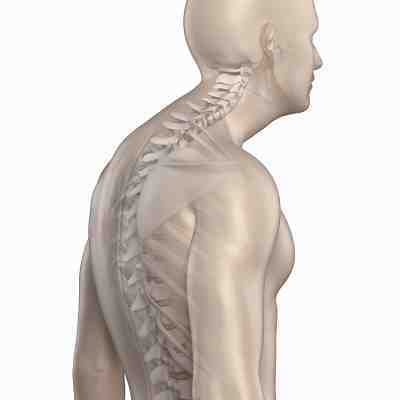 I find that the primary cause of Middle Back pain is due to a poor sitting posture. When your mid back is placed on stretch for an excess length of time - or repetitively over time - it will eventually become strained and cause pain. To explain the pain that can come from this type of straining, I often ask my clients to stretch their little finger backwards with pressure for one minute! In this section, we look at some of the main causes of Middle Back Pain and some associated conditions. Kyphosis is a term we use to describe the curve in the middle of your back. Viewed from the side it is the area in your back that curves outwards. Pain in the Middle part of the back s a common complaint where the ligaments, joints and muscles are put under excess pressure, often due to a poor sitting posture or lifting technique.